I Laugh, Therefore, I AM: M Burger! We Chicagoans are pretty lucky folk when it comes to food. Yes, we have Chicago deep dish pizza (a heavenly creation if there ever was one) and just about every other type of cuisine this world has to offer. But recently, we got "M Burger." Some folks that I sing with at church choir treated me to my first M Burger after church the other day. They were amazed that I hadn't had one yet. 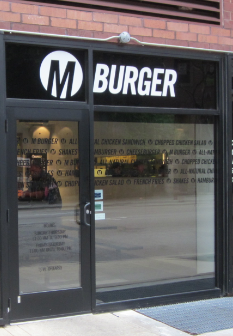 Apparently, when M Burger opened in Chicago, it caught on and there were lines around the block. The thing is, there are only two MBurger establishments in Chicago and both of them are teeny-tiny places. So, what makes an MBurger so incredible? First, the meat is fresh and it's char-grilled to order. Next, it's topped with sharp cheddar. It also contains their own special sauce and (here's the clincher) slices of thick, sweet, smokey bacon. Aside from all that, the M Burger employees are always super-duper friendly. They know they're onto a good thing. You put all that together, and you've got the M Burger experience. I was singing for a wedding this afternoon and during the ceremony I realized I had hardly eaten anything all day. I was one hungry puppy. Then, I realized that one of the two M Burger places was on my way home. Finally, the couple said their "I do's", I shucked my choir robe and headed to ground zero of hamburger heaven. See? It's just an inconspicuous, tiny place. So, if you're ever in Chicago, visit the Sears Tower, go to a Cubs game, eat a deep dish pizza. But also have yourself an M Burger. I saw the last photo and my tummy growled. That is some savory lookin' chow! I see why you skip the fries. Who needs a yucky old pertaters with burgers like that??? 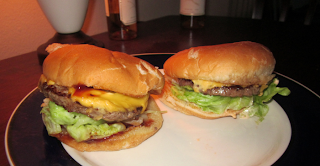 I don't usually eat hamburger--I prefer the Turkey Burger--but those look Mmm-Mmm good. So what does M stand for?